A pure amino acid powder, required by the body for a range of repair and maintenance functions, such as wound healing, muscle and bone growth, digestive health and gut wall integrity. For instance, it helps to protect against leaky gut syndrome and food intolerance reactions. 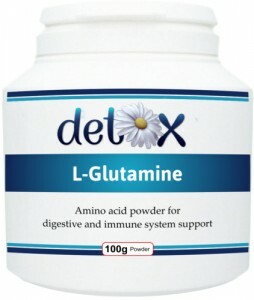 It is also widely used by people with various forms of digestive and intestinal problems, an overtaxed or exhausted immune system, as well as by athletes following gruelling training routines - breaks down uric acid from proteins. Daily usage varies from 5g to 30g per day, depending upon requirements. Can be combined with our other digestive system supplements and intestinal products for tissue repair and integrity.